I have 2,984 pictures from 2017 after culling probably as many again. Picking one from each calendar month is difficult – some months yield nothing of note while others result in several which would be in my top twelve for the year. I could do twelve food pictures, twelve of London, twelve of each of the beautiful places I have been to this year – Suffolk, the Isles of Scilly, the west of Ireland, Chicago, and the battlefields east of Arras among them. The “best” picture from each month is not necessarily one of the top twelve for the year. Here goes, anyway. 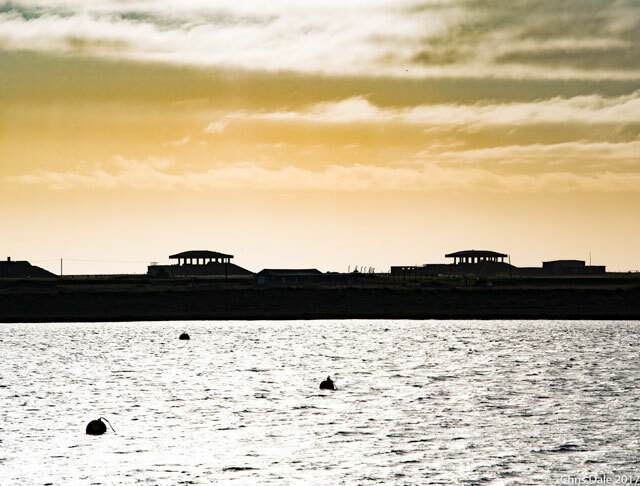 My mother lives in Orford on the Suffolk coast, and we stayed there for a week in January. I went for a longer walk than I intended along the sea wall and back across the marshes. The blisters were worth it. My February folder is rather bare except for pictures of conferences and food. 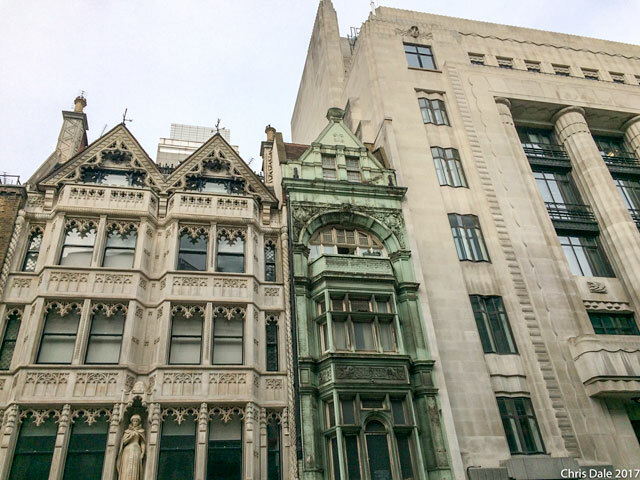 I had a meeting in a room in Fleet Street which looked out on elevations I have never noticed before. It was a dull day, and this was taken with an old iPhone. March is similarly short of choices. 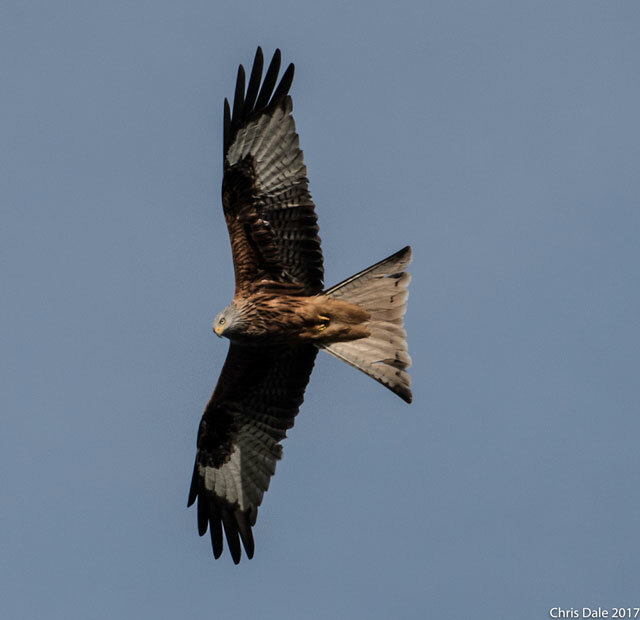 A red kite hovered over me on Oxford’s Port Meadow, and while this would win no prizes in a bird pictures competition, it is a reminder that we now take these amazing birds for granted – I see more kites than thrushes close to home. Another one from just beyond my doorstep. 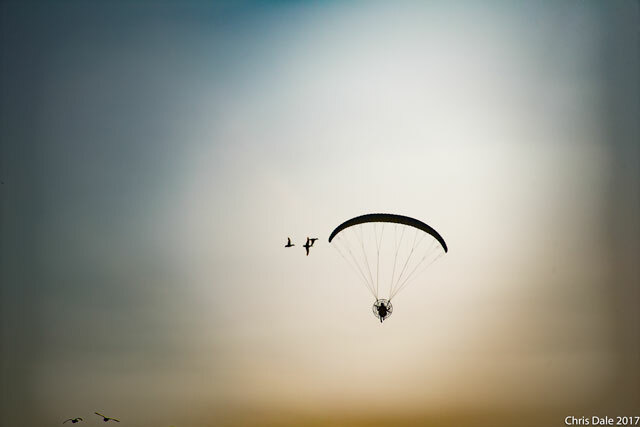 The microlight flying westward into the evening light seems to have attracted some company. May brings too many choices. We spent a week on St Agnes in the Isles of Scilly with not much to do except take photographs of one of the most beautiful spots in the world. 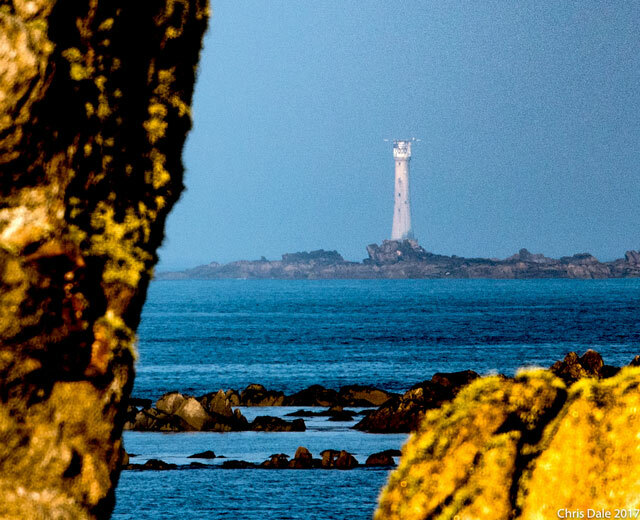 This one is of the Bishop Rock Lighthouse. There are more pictures on Flickr in sets called Journey to St Agnes and St Agnes Isles of Scilly. June took us to the west of Ireland for a few days, again giving me too many pictures to choose from. The pattern in this field caught my eye as we looked northwards from County Clare across Galway Bay. One of my favourite modern memorials is that to the firefighters and others who worked through the Blitz to protect lives and property. This statue stands south of St Paul’s Cathedral. 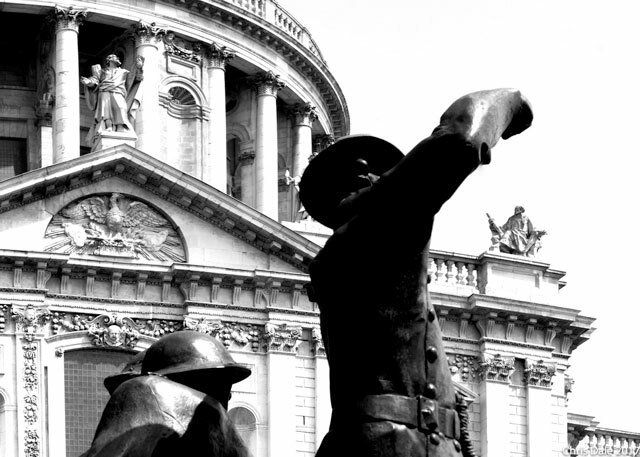 I like the juxtaposition between the modern firefighter and the old sage sitting on St Paul’s. I stayed at the Mandalay Bay Hotel in Las Vegas in August, shortly before it became infamous for other reasons. It is one of the world’s more vulgarly ostentatious buildings, but this snippet (taken with an iPhone) disguises the vulgarity. 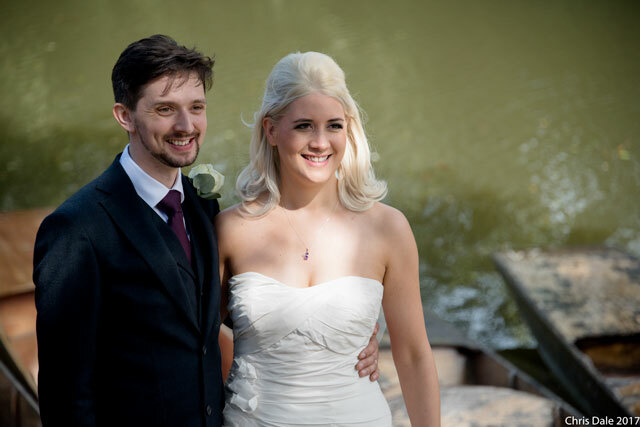 In September, our eldest son Charlie married Kat in Oxford. The reception was held by the River Cherwell. What could be lovelier than this? September also brought a light show to Oxford, illuminating its buildings rather attractively. There is a Flickr set called Oxford Illuminations. In October, we went to Canons Ashby, a small country house in Northamptonshire next door to an ancient church. 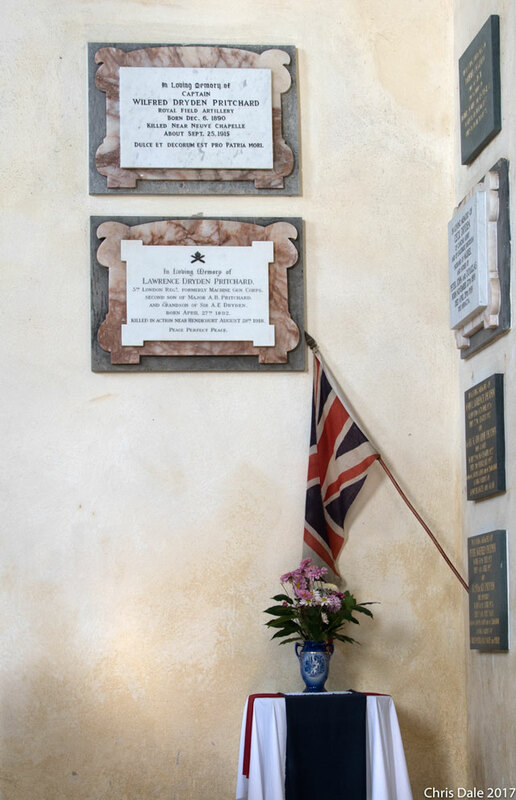 These two memorials have a story behind them which I will tell elsewhere. For the moment, I just give it as a picture. Whoever arranged this corner has a true eye for composition. There are other pictures of both house and church on Flickr in a set called Canons Ashby. Coming into Heathrow, I was lucky enough to be on the starboard side of the plane as it banked over the Thames and to have my proper camera with me. 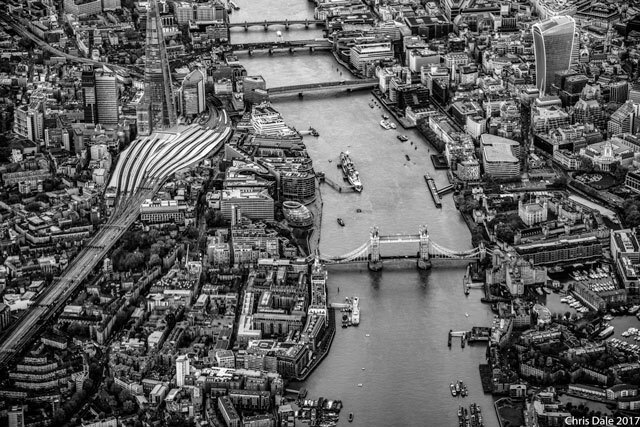 This view, of London Bridge station, Tower Bridge, HMS Belfast and the rest, is one of a series which can be found on Flickr in a set called London from the air. We try and go each year to part of the Western Front, choosing the winter months when no one else is around. 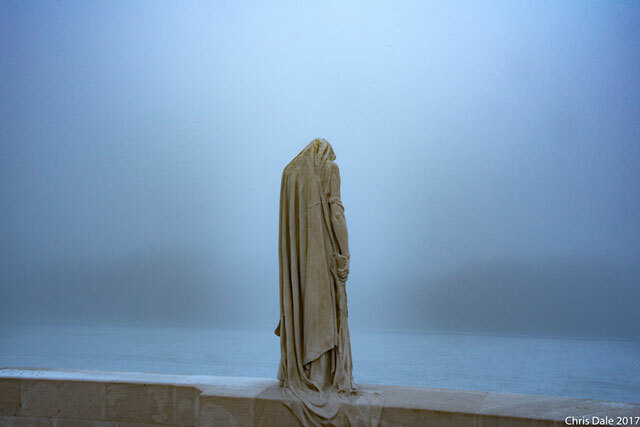 The Vimy memorial was shrouded in deep fog which denied us a view across the Douai plain which was the target of the Canadian forces in April 1917; it gave us an atmosphere, however, which summer tourists miss. This is Canada Bereft, one of the very fine statues on and around the monument itself. There are other pictures from that morning in a Flickr set called Vimy Ridge. Other pictures from that short tour are on Flickr as 2017-12 Western Front. Noticing that someone has gone missing on Twitter. Did they give it up? Block you? Perhaps they’ve died. Oh.